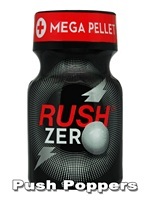 It's finally here, the brand new Rush Poppers ZERO - such an intense aroma you've never experienced before! After months of research, finally an absolutely new aroma was created. This extraordinary Poppers from the new ZERO series is an unbeatable exciting, long lasting and extremely strong liquid aroma. With the addition of a newly developed, super large MEGA pellet it is able to remove any water in the liquid to stay longer fresh and to ensure the longevity of this top product. You want to live out your most intense desires? Take Rush Zero and everything is possible.